Racing is a sociable sport, so first and foremost enjoy yourself. 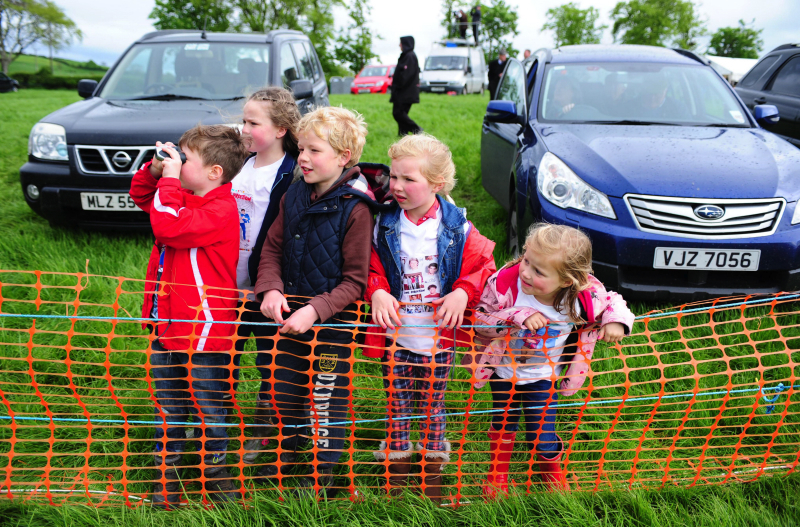 Have fun and take in the atmosphere as from the moment you arrive at your chosen point-to-point, you are set for a fun filled day of outdoor sport for the whole family. 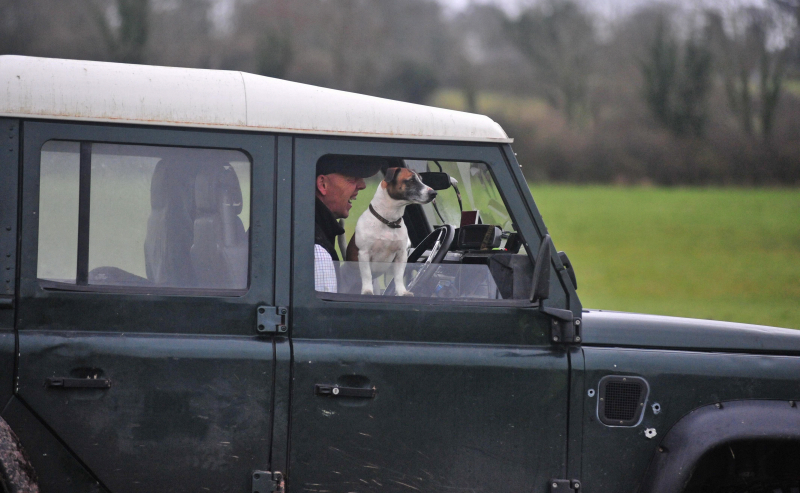 Continue reading for a guide of what you can expect from your day at a point-to-point, or to go straight to a specific section, click on the section headings. All point-to-points offer free parking so once you get the car parked you can use this as your base for the day ahead. If you are there early, why not walk the track alongside the jockeys, or have a wander around to get your baring’s for the day. Check what food offerings are available for later in the day when you start to get peckish and scope out where you fancy watching some of the racing. Remember one of the real gems of point-to-point racing is how close you can get to the action. Some point-to-points that offer online e-tickets on their course page also provide you with a race card voucher that you present on the day, offering you a nice little saving! Once you have your hands on a racecard, it’s time to take a look at the runners for the day’s first race. Unlike at a racecourse where each of the horses listed in your racecard are set to run that day. 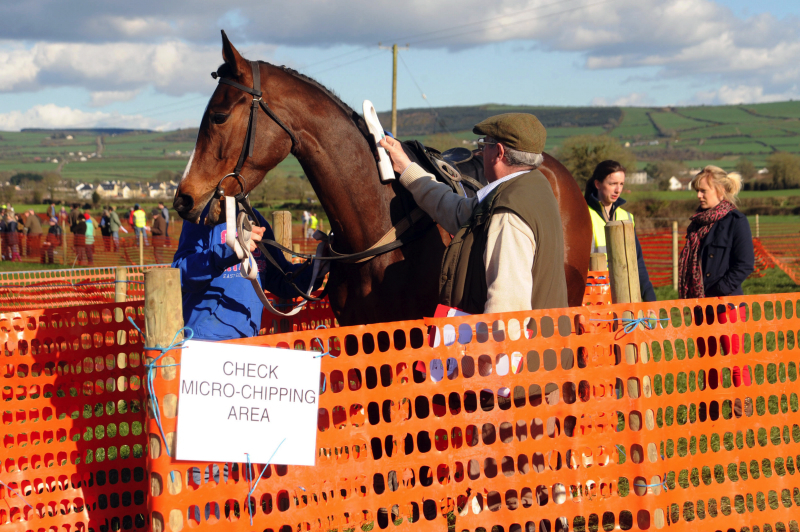 At a point-to-point, trainers will only declare their horses to run one hour before their race. This means that it is only the initial entries which have been made a couple of days beforehand will appear in the racecard. Don't worry, our guide to the racecard will give you all the little pointers that you need to get through your day. Once the deadline has passed for horses to be declared, which is one hour before the start time of each race, you will be able to find the list of runners and riders displayed on a board prominently positioned close to the parade ring. Alternatively, listen out to the course announcer will call out the runners and riders for each race over the PA.
Jot these down in your racecard and then you are good to go for the first race. Once you have the runners you have the opportunity to get close to the pre-race preparation for each horse. This involves the handler of each horse saddling their runner in the lorry car park as well as giving their charge any last minute flicks of a brush before they head to the parade ring before their race. Make the most of your day at the races by getting up close to the action before the racing has even begun. At most tracks, you will be able to see the horses being prepared for their race in the lorry park. Here, their trainer will saddle the horse and go through the final preparations. Horses should seem alert, but not unsettled and a sleek and shiny coat indicates that a horse is in good health. You never know what horse might catch your eye to help you make up your mind as to what who you have a little bet on. As the build-up continues, the horses will make their away to the parade ring about 15 – 20 minutes before the start time. Here they will parade in front of you and your fellow racegoers. This is another opportunity for you to take a look at the horses before the race, whilst you will also see the owners, trainers and jockeys gather to discuss their tactics, before heading out onto the track. One of the big parts of a day at the races is having a little bet. 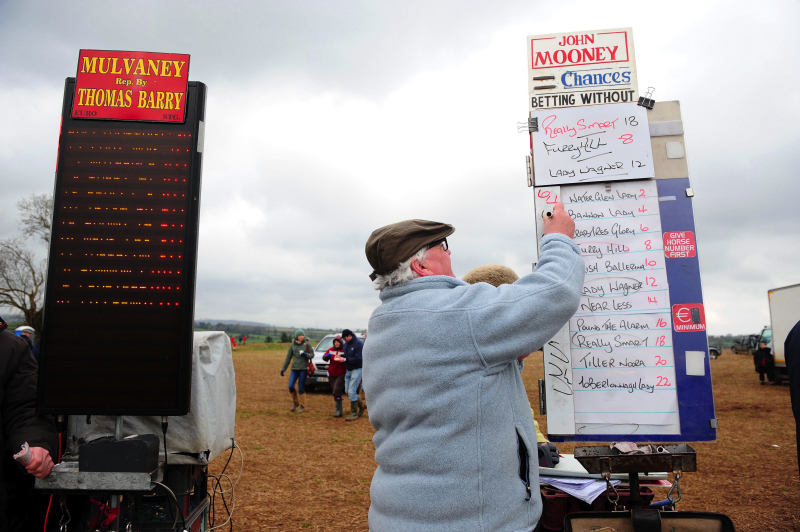 Just like at the racecourse, there will be a betting ring at a point-to-point race meeting with a number of bookmakers betting on the day’s racing. After checking out the horses in the parade ring and looking through the racecard, head on over to the betting ring as the horses are making their way down to the start to make your selection. It is very simple to place a bet and the bookmakers will help you out if you are unsure. All you have to do is select the horse you fancy and decide what type of bet you wish to place. Your bet can be as small or as large as you like and you will receive a ticket which will record your selection and how much you have bet. This is your receipt, so remember to keep it safe as you will hopefully need it to collect all your winnings after the race! We have more information on how to place a bet at a point-to-point in our guide which you can check out by clicking HERE. Once the horses are circling at the start, now is the time to pick your viewing spot for this race. By going to a point-to-point, you will get a lot closer to the action than is often the case at a racecourse, so take advantage of this. Head over to one of the fences to feel the power of the horses as they jump a fence in full flight, or get close to the winning post for a birds eye view of the thrilling action. Almost all point-to-point races are run over 3-miles with the horses jumping approximately 15-fences, so you will have the added bonus of witnessing the horses pass you three times at most courses. As the race has finished, the horses will return to the parade ring, with the winning horse and it’s, owner, training and jockey all posing for a picture as the presentation is made. All horses are washed and cooled down by their handlers where you can again witness first-hand the care each horse receives from their groom. If you have been lucky enough to have a winning bet, don’t forget to head back to the bookmaker who you placed your bet with to collect your winnings! Typically there is 30-minutes between each race, so attention quickly turns to the next race. If you are starting to feel a little peckish, don’t worry as every point-to-point meeting has some form of food catering available on the day that can vary from a burger and chips to tasty home-made sandwiches and tea made voluntarily by the committee members. Many point-to-point race goers bring picnics to enjoy during the racing which they can do from the comfort of the boot of their car. This allows them to be able to watch the action throughout the day whilst tucking into some of their delicious homemade treats. If you would like something a little stronger than tea to keep you warm during the day, a number of point-to-point fixtures offer a bar service including serve hot whiskies and port and other alcoholic drinks at their meeting. There is no official dress code for point-to-points but as they take place through all four seasons of the typically unpredictable Irish weather, you never know what you might be faced with! We advise race goers to stay warm and dry for your days racing and to always come prepared. Many point-to-points also hold competitions for the most appropriately dressed lady or gentlemen, so what better way to show off your colourful wellies or bobble hats than to wear them to the point-to-point. Many point-to-points have some form of children’s entertainment available on the day from bouncy castles to face painting, and parents can bring their little people along to enjoy all of the on and off-track fun. Point-to-points offer something for everyone with an increasing amount of fixtures holding Craft & Artisan Food Fairs at their meetings. These trade stands display the finest of local and Irish produced goods which allows you to sample, purchase and take home lots of these locally produced goodies. The pony racing circuit in Ireland has produced some of the leading riders over the years and some point-to-points have begun to hold pony races after their day’s action. Pony races are broken down into different categories consisting of heights and ages of the ponies taking part and are ridden by eager young riders, with many going on to become budding jockeys later in their careers. 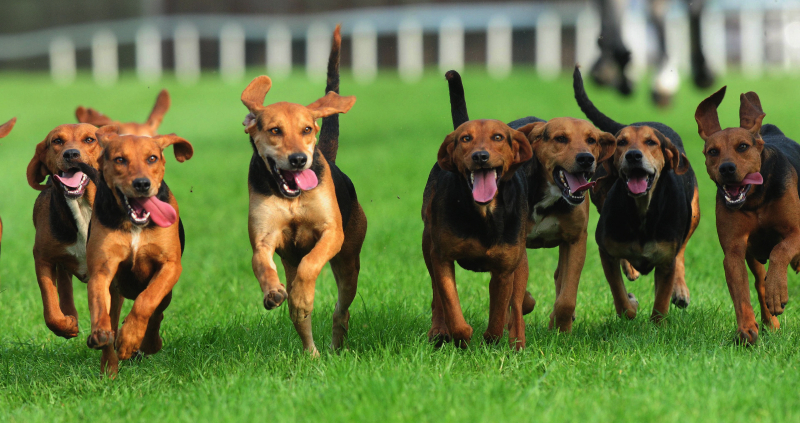 All point-to-point’s welcome dogs to their meetings which allows the race goers to include the whole family on their day out. An increasing amount of fixtures hold dog shows during their meeting which allows spectators pooches to take part in the action. Classes cater for the waggiest tailed dog to the dog you would most like to take home. As the attractions of each point-to-point vary from course to course, we recommend checking out the individual course pages to see what each has to offer. Point-to-Points across the country would not take place without the dedicated volunteers who freely give of their time so enthusiastically. Organising committees could always do with an extra pair of hands, so if you would like to get even closer to the action and involved in the running of a point-to-point, you would be made very welcome. If you are interested in getting involved, head on over to our Course Finder page HERE to see the tracks which are nearby. You will find the contact details for that point-to-point secretary on their fixture page.